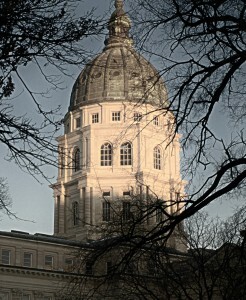 This week the Kansas House of Representatives considered a bill that would expand the application of tax increment financing (TIF) and community improvement district taxes. The bill, HB 2086, is not a major expansion, but is still harmful. On the following day, Rep. Scott Schwab made a motion to reconsider. If agreed to, Schwab’s motion would force another vote on the passage of the bill. The motion passed, and when the vote on the bill was tallied, it had passed with 81 votes. Democrats who changed their votes from No to Yes are Barbara Ballard, Brandon Whipple, Ed Trimmer, Jerry Henry, Julie Menghini, Nancy Lusk, Patricia Sloop, Paul Davis, Stan Frownfelter, Tom Burroughs and Valdenia Winn. Republicans who changed their votes from No to Yes are Dennis Hedke, James Todd, Kelly Meigs, Kevin Jones, Marty Read, Ramon Gonzalez, Scott Schwab, and Vern Swanson. One Republican, Marc Rhoades, changed his vote from Yes to No. The original coalition of votes that defeated the bill on Monday was a mix of free-market Republicans and Democrats. The free-market members vote against this bill because it is contrary to the principals of capitalism. Many Democrats vote against bills like this because they see it as welfare for greedy developers or other business interests. An example of the latter is Rep. Ed Trimmer, who on the Kansas Economic Freedom Index for last year scored very near the bottom in terms of voting for economic freedom. But somehow, he and the other Democrats listed above were persuaded to change their votes. But as is often the case in politics, legislators’ campaign rhetoric and promises don’t align with their actual votes. For example, in the 2011 session of the Kansas Legislature HB 2194 was introduced, which in its original form would have created the Kansas Advisory Council on Privatization and Public-Private Partnerships. This bill passed by a vote of 68 to 51 in the House of Representatives and did not advance in the Senate. Wichita-area legislators who are running for re-election and who voted against this bill included Dillmore, Gail Finney, Geraldine Flaharty, Dan Kerschen, Dillmore’s current opponent Brenda Landwehr, and Jim Ward. But this bill — and two others described below — proposed to spend modest amounts aimed at increasing the manageability and efficiency of government, not the actual size and scope of government itself. As it turns out, many in the legislature are happy with the operations of state government remaining in the shadows, despite claims made during campaigns. Another bill from 2011 was HB 2158, which would have created performance measures for state agencies and reported that information to the public. The supplemental note says that the bill “as amended, would institute a new process for modifying current performance measures and establishing new standardized performance measures to be used by all state agencies in support of the annual budget requests. State agencies would be required to consult with representatives of the Director of the Budget and the Legislative Research Department to modify each agency’s current performance measures, to standardize such performance measures, and to utilize best practices in all state agencies.” Results of the performance measures would be posted on a public website. This bill passed the House of Representatives by a nearly unanimous vote of 119 to 2, with Wichita’s Dillmore and Flaherty the two nay votes. The bill didn’t advance in the Senate. Another 2011 bill was HB 2120, which according to its supplemental note “would establish the Kansas Streamlining Government Act, which would have the purpose of improving the performance, efficiency, and operations of state government by reviewing certain state agencies, programs, boards, and commissions.” Fee-funded agencies — examples include Kansas dental board and Kansas real estate commission — would be exempt from this bill. The bill passed the House of Representatives by a vote of 79 to 40. It died in the Senate. Wichita-area legislators who are running for re-election and who voted against this bill included Dillmore, Finney, Flaharty, Landwehr, and Ward. As Kansas Republicans decide who to vote for in next week’s primary election, moderate senate incumbents and many newspapers urge voting for those Republicans who promote a “reasonable,” “balanced,” and “responsible” approach to Kansas government. When we examine the record of the coalition of moderate Republicans and Democrats that governed Kansas for the first decade of this century, we see legislative accomplishment that not many Kansans may be aware of. Almost all have been harmful to our state. Most of the moderate Republicans run campaigns promoting themselves as fiscal conservatives. But their voting records often tell a different story. That’s why in 2010 I produced the Kansas Economic Freedom Index to shine light on the actual votes cast by legislators. This year I joined with Kansas Policy Institute and Americans for Prosperity–Kansas to produce a larger and more structured index. Kansans might be surprised to learn that the senator who ranks lowest in voting for economic freedom is a Republican. Incredibly, not long ago Kansas was the only state to have a loss in private sector jobs over a year-long period. This is the culmination of governance by the coalition of moderate, traditional Kansas Republicans and Democrats. Analysis in the current edition of Rich States, Poor States: ALEC-Laffer State Economic Competitiveness Index confirms that the Kansas economy has not performed well. The “Economic Outlook Ranking” is a forecast looking forward, based on factors that are under control of the states. The “Economic Performance Ranking” is a backward-looking rating that measures state performance, again using variables under control of each state. For Economic Performance Ranking, Kansas is ranked 39 among the states, near the bottom in terms of positive performance. In the 2010 edition, Kansas was ranked 40th, and in 2010, 34th. Kansas is not making progress in this ranking of state performance. In the forward-looking Economic Outlook Ranking, Kansas ranks 26th. Again, Kansas is not making progress, compared to other states. In annual rankings since 2008 Kansas has been ranked 29, 24, 25, 27, and now 26. Further evidence of the harm of moderate Republican/Democratic governance was revealed earlier this year when the Tax Foundation released a report examining tax costs on business in the states and in selected cities in each state. The news for Kansas is worse than merely bad, as our state couldn’t have performed much worse: Kansas ranks 47th among the states for tax costs for mature business firms, and 48th for new firms. See Kansas reasonable: We’re number 47 (and 48). On government reform, moderate Republicans have blocked efforts to improve the operations and reduce the cost of Kansas state government. In 2011 the Kansas Legislature lost three opportunities to do just this. Three bills, each with this goal, were passed by the House of Representatives, but each failed to pass through the moderate-controlled Senate, or had its contents stripped and replaced with different legislation. See Kansas reasonable: Government reform. Moderates are proud of keeping politics out of judicial selection. 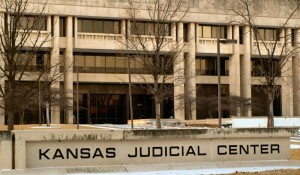 In reality, Kansas judicial selection is highly politicized and undemocratic, with out-sized power concentrated in a special interest group: lawyers. Among the fifty states, Kansas is at the undemocratic extreme in the way we select judges, and moderates defend this system. 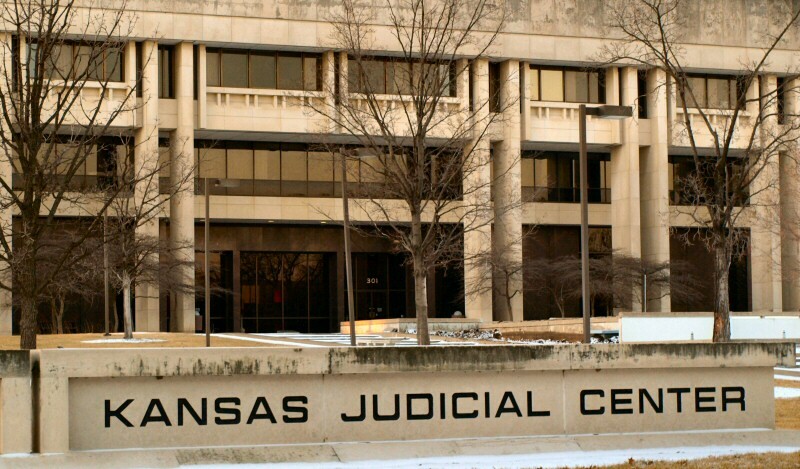 See Kansas reasonable: Judicial selection. Moderates usually claim that they are the “education” candidate, and are proud of their support for spending on Kansas schools. They “march in lockstep” with those who constantly call for more school spending, even to the point of suing the state’s taxpayers for more money. They join with the special interests who fight against accountability measures. They also fight against an honest assessment of the condition of public schools in Kansas, and when you look under the covers, it’s not the pretty picture that education bureaucrats paint. As an example, compare Kansas with Texas, a state that Kansas school spending boosters and moderate Republicans like to deride as a state with low-performing schools. In Kansas 69 percent of students are white, while in Texas that number is 33 percent. So it’s not surprising that overall, Kansas outperforms Texas (with one tie) when considering all students in four important areas: fourth and eighth grade reading, and fourth and eighth grade math. But looking at Hispanic students only, Texas beats or ties Kansas in these four areas. For black students, Texas bests Kansas in all four. Texas does this with much less spending per pupil than Kansas. See Kansas reasonable: The education candidates. A recent column described traditional, moderate Kansas Republicans as those who “believe government has a more affirmative role in assuring a high quality of life for Kansans.” The record, however, is one that has placed Kansas at disadvantage to other states, and it will be difficult to recover. Kansas traditional: the platform. As campaigns for positions in the Kansas Legislature heat up, some are calling for voters to support candidates who will follow a tradition of “reasonableness” that, they say, is characteristic of successful Kansas politicians — the “traditional” Republicans. The record of Kansas government policies has not been one we can be proud of. It is not reasonable, balanced, or responsible to continue with the policies that caused this lost decade. Kansans need to support candidates who will vote in favor of economic freedom, which is the key to jobs and prosperity for Kansas. The Kansas Economic Freedom Index is a resource that voters can use to learn more about incumbent candidates and how they voted on issues of economic freedom. The Kansas Chamber of Commerce Political Action Committee has made campaign contributions to the primary election opponents of eight Republican members of the Kansas Senate that it sees as impediments to private sector job creation, according to reporting in the Lawrence Journal-World. Following is the 2010 Kansas Senate roster with each senator’s score on the Kansas Economic Freedom Index for that year. The names of the senators whose opponents are supported by the Kansas Chamber PAC appear in boldface. You can see that as a group, these senators rank very low in their support of issues important to economic freedom in Kansas. Elections coming up. On Tuesday April 5 voters across Kansas will vote in city and school board elections. Voting has been underway for about a week through the advance voting process. For those who haven’t yet decided, here’s the Wichita Eagle voter guide. You can get a list of the candidates, along with their responses to questions, customized for your address. In Kansas, cutting unnecessary spending can avoid service cuts. Following up on Kansas state agency spending, Kansas Policy Institute finds examples of spending on overtime, advertising, cell phones, and dues, memberships and subscriptions totaling $50 million. KPI president Dave Trabert remarked: “Hardly a day goes by that we don’t see some group or state agency saying they will have to cut necessary services if their funding is reduced, but it’s pretty clear that there are lots of other ways to reduce spending. Some degree of spending in these categories is understandable, but the data clearly show that large amounts of taxpayer money are being spent unnecessarily.” Other examples uncovered by KPI: “The Legislature spent $144,408 to join the National Council of State Legislators and also spent $107,022 to join the Council of State Governments. The Governor’s office bought memberships in three governors’ associations: the National Governor’s Association ($83,800), the Western Governors’ Association ($36,000) and the Midwestern Governors’ Association ($10,000).” More is in the KPI press release K-State #1 in Cell Phone Spending: Cutting unnecessary spending can avoid service cuts. March to Economic Growth stalled. 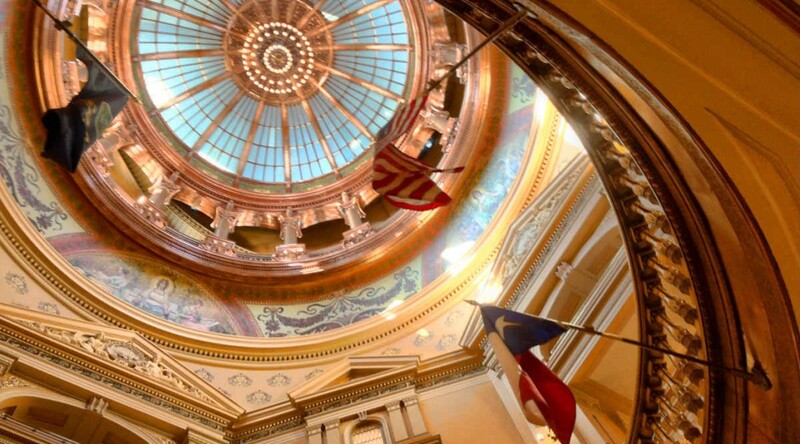 The Kansas House of Representatives has passed a bill that would gradually reduce Kansas personal and corporate income tax rates. The so-called MEGA bill wold create a mechanism where if revenue flowing to the state increases, income tax rates would be reduced proportionally, after adjusting for inflation. Besides lowering these tax rates, which would make Kansas more attractive to business and jobs, the bill would also decrease the rate of growth of spending. But Senate leadership, namely its president, doesn’t care for the bill, so it appears it is dead this year. Last year Senate President Stephen Morris was strongly in favor of the statewide sales tax increase. Despite being a member of the Republican Party, he is part of the Senate’s liberal wing, according to the Kansas Economic Freedom Index and other legislative ratings. Government spending overrides privates spending. The last two days have featured readings from Robert P. Murphy’s book Lessons for the Young Economist on the importance of profits and loses in guiding investment, and how government is unable to calculate its profit or loss. Today, Murphy explains government spending and the political process: For example, suppose the government decides to build a public library in order to make books and internet access free to the community. Because the government only has a limited budget, it won’t do something ridiculously wasteful such as coating the library with gold, or stocking the shelves with extremely rare first editions of Steinbeck and Hemingway novels. Suppose the government tries to be conscientious, puts out bids to several reputable contractors, and has a modest library constructed for $400,000. Yet even if outside auditors or investigative journalists could find nothing corrupt or shocking about the process, the question would still remain: Was it worth it to spend $400,000 on building this particular library, in this particular location? The crucial point is that we know one thing for certain: No entrepreneur thought that he could earn enough revenues from charging for book borrowing to make such an enterprise worthwhile. We know this because the library didn’t exist until the government used its own funds to build it! One way to think about government expenditures is that they necessarily call forth the creation of goods and services that people in the private sector did not deem worth producing. When the government spends money, it directs resources away from where private spending decisions would have steered them, and into projects that would not be profitable if private entrepreneurs had produced them relying on voluntary funding. Thus the political authorities in an interventionist economy face one-half of the socialist calculation problem. … The government in essence is a giant distributor of charitable donations. Even those citizens who welcome the concept should ask themselves: Why do we need to route our donations through the political process? Why not decentralize the decisions and allow each person to donate his or her funds to the various charities that seem most worthy? … Regardless of its possible benefits, government spending suffers from the calculation problem afflicting socialism. The system allows a select group of political authorities to override the input of private individuals in how (some of) their property should be used to steer resources into various projects. This is a very serious drawback for anyone who favors interventionism as a way to increase the “general welfare,” however defined. Kansas income is growing. While still lower than its peak in 2008, wage and salary income in Kansas is on the way up, and has been throughout 2010. Elections tomorrow. On Tuesday voters across Kansas will vote in city and school board primary elections. Well, at least a few will vote, as it is thought that only nine percent of eligible voters will actually vote. Many of those may have already voted by now, as advance voting is popular. For those who haven’t yet decided, here’s the Wichita Eagle voter guide. Kansas schools can transfer funds? A recent legislative update by Kansas Representative Bob Brookens, a Republican from Marion, tells readers this about Kansas school finance: “Most school districts in our area braced for this possibility by taking advantage of a law passed last year by the legislature; the new provision allowed schools this one time to transfer funds from certain other areas to their contingency reserve fund, just in case the state had a budget hole in fiscal year 2011; and most of the school districts around here moved all they were allowed to.” Thing is, no one can seem to remember the law Brookens refers to. There were several such laws proposed, but none made their way through the legislature to become law. Ranzau stand on federal funds profiled. New Sedgwick County Commission member Richard Ranzau has taken a consistent stand against accepting federal grant funds, as explained in a Wichita Eagle story. While his efforts won’t presently reduce federal spending or debt, as explained in the article by H. Edward Flentje, Professor at the Hugo Wall School of Urban and Public Affairs at Wichita State University (“Those funds are authorized, they’re budgeted, they’re appropriated, and (a) federal agency will commit the funds elsewhere.”), someone, somewhere, has to take a stand. While we usually think about the federal — and state — spending problem requiring a solution from the top, spending can also be controlled from the bottom up. Those federal elected officials who represent Sedgwick County and are concerned about federal spending — that would be Representative Mike Pompeo and Senators Jerry Moran and Pat Roberts — need to take notice and support Ranzau. Those serving in the Kansas legislature should take notice, too. Kansas legislative chambers don’t agree. Kansas Reporter details the problems conferees from the House of Representatives and Senate face coming to agreement on the rescission bill. Funding for special education seems the problem. The rescission bill makes cuts to spending so that the current year’s budget balances. More at House, Senate can’t agree how to fund special ed. Citizens, not taxpayers. A column in the McPherson Sentinel argues that we should think of ourselves as “citizens,” not merely “taxpayers.” The difference, as I read the article, is that a citizen is involved in government and public policy: “It takes work, hard work, to make this system work.” Taxpayers, on the other hand, just pay and expect something back: “‘Look at how much I paid,’ these people cry. ‘Give me my money’s worth! '” The writer makes the case that government “is not a simplistic fiscal transaction” and that citizens must participate to make sure that government does good things with taxes. … The writer gets one thing right. Meeting the needs of the country is complex. Where I don’t agree with the writer is that government is the best way — or even a feasible way — to meet the needs of the country. A method already exists: people trading voluntarily in free markets, guided by profit and loss, with information conveyed by an unfettered price system. Government, with its central planning, its lack of ability to calculate profit and loss, and inevitable tendency to become captured by special interests, is not equipped for this task. Kansas Economic Freedom Index. This week I produced the first version of the Kansas Economic Freedom Index: Who votes for and against economic freedom in Kansas? for the 2011 legislative session. Currently I have a version only for the House of Representatives, as the Senate hasn’t made many votes that affect economic freedom. The index now has its own site, kansaseconomicfreedom.com. Increasing taxes not seen as solution. “Leaving aside the moral objection to tax increases, raising taxes won’t in fact solve the problem. For one thing, our public servants always seem to find something new on which to spend the additional money, and it isn’t deficit reduction. But more to the point, tax policy can go only so far, given the natural brick wall it has run into for the past fifty years. Economist Jeffrey Rogers Hummel points out that federal tax revenue ‘has bumped up against 20 percent of GDP for well over half a century. That is quite an astonishing statistic when you think about all the changes in the tax code over the intervening years. Tax rates go up, tax rates go down, and the total bite out of the economy remains relatively constant. This suggests that 20 percent is some kind of structural-political limit for federal taxes in the United States. '” From Rollback: Repealing Big Government Before the Coming Fiscal Collapse by Thomas E. Woods, Jr. Hummel’s article may be read at Why Default on U.S. Treasuries is Likely. Elections this week. On Tuesday voters across Kansas will vote in city and school board primary elections. Well, at least a few will vote, as it is thought that only nine percent of eligible voters will actually vote. Many of those may have already voted by now, as advance voting is popular. For those who haven’t yet decided, here’s the Wichita Eagle voter guide. Civility is lost on the Wisconsin protesters. Lost not only in Wisconsin, but across the country, writes Michelle Malkin in Washington Examiner. “President Obama’s new era of civility was over before it began. You wouldn’t know it from reading The New York Times, watching Katie Couric or listening to the Democratic manners police. But America has been overrun by foul-mouthed, fist-clenching wildebeests. Yes, the Tea Party Movement is responsible — for sending these liberal goons into an insane rage, that is. After enduring two years of false smears as sexist, racist, homophobic barbarians, it is grassroots conservatives and taxpayer advocates who have been ceaselessly subjected to rhetorical projectile vomit. It is Obama’s rank-and-file “community organizers” on the streets fomenting the hate against their political enemies. Not the other way around.” … Malkin details the viciousness of some of the political activity across the country, some of which is especially demeaning to minorities — and women, as we’ve seen in Kansas this week. Help Wisconsin Governor Walker. Tim Phillips of Americans for Prosperity explains what’s happening in Wisconsin: “Governor Walker is simply repairing the Wisconsin budget by reining in the overly generous pension and benefits packages that are far beyond what people in the private sector receive. He’s also ending the government union collective bargaining that has been the chief reason why union benefits and pensions have gotten so out of control.” … Phillips recommends supporting Walker by signing a petition stating: “Union dues should be voluntary, and the state should not be in the business of collecting them. Union certification should require a secret ballot. Collective bargaining should not be used to force extravagant pension and health benefits that cripple state budgets. These common-sense reforms have made the union bosses desperate to disrupt Wisconsin government and overturn an election. They must not be allowed to succeed. In fact, every state should adopt Governor Scott Walker’s common sense reforms.” Click on Stand With Walker to express your support. Steineger switches teams. Chris Steineger, a Kansas State Senator from Kansas City, has switched to the Republican Party. As a Democrat, Steineger had compiled a voting record more conservative than many senate Republicans. On the Kansas Economic Freedom Index for this year — recognizing that supporting economic freedom is not the same as conservatism or Republicanism — Steineger had a voting record more in favor of economic freedom than that of 15 of the senate’s Republicans. Kansas school funding reform to wait. Incoming Kansas Governor Sam Brownback says that the Kansas economy comes first, and then school finance, Medicaid, and KPERS in a “year or two.” Tim Carpenter of the Topeka Capital-Journal reports in Revitalizing the Kansas economy is the governor-elect’s No. 1 priority. Tax cuts in Kansas not likely, says new senate leader. Yesterday Kansas Senate Republicans elected Jay Emler of Lindsborg to be the majority leader, replacing Derek Schmidt, who will become Attorney General. As the Associated Press reports, Emler is not in favor of any tax cuts, including a repeal of the recent increase in the statewide sales tax. McGinn to lead Ways and Means. Carolyn McGinn, a Kansas Senator from Sedgwick, will chair the Ways and Means Committee. This important committee handles appropriations — in other words, the actual spending of money. On the Kansas Economic Freedom Index for this year, McGinn scored seven percent, tying her with Senate President Stephen Morris as the Republicans most opposed to economic freedom. She also scores low in the Kansas Taxpayer Network/Americans for Prosperity ratings. Kansas holds on to House seats. At one time it was feared that the 2010 U.S. Census might find Kansas losing one of its four seats in the U.S. House of Representatives. But Kansas will retain them. Texas picks up four seats, Florida adds two, while Georgia, South Carolina, Arizona, Nevada, and Utah gain one seat each. Ohio and New York lose two each, while Illinois, Iowa, Massachusetts, Michigan, Missouri, and New Jersey lose one each. Rasmussen polls. As often, Rasmussen is the bearer of bad news. Like: What’s the deal with Obama? “For the first time since he became president, only 35% of voters say Barack Obama thinks society is fair and decent. That’s almost half as many as voters who hold that belief themselves. A new Rasmussen Reports telephone survey finds that 49%, on the other hand, say Obama thinks society is unfair and discriminatory.” See America’s Best Days: Fewer Voters Than Ever Say Obama Thinks Society is Fair and Decent. … Tea Party people skeptical of newly elected officeholders: “Most Tea Party members view the candidates they elected in November as agents of change from government business as usual, but non-members are a lot more skeptical. A new Rasmussen Reports national telephone poll finds that only 34% of all Likely U.S. Voters think Tea Party candidates elected in November will remain true to their beliefs. See Most Tea Party Members Think Those They Elected Won’t Sell Out, Others Aren’t So Sure. … Others are pessimistic, too: “Just 23% of Likely U.S. Voters now say the country is heading in the right direction.” See Right Direction or Wrong Track. Kansas Senator Lee to tax court. State of the State KS reports that Kansas Senator Janis Lee has been appointed by Governor Mark Parkinson to the Kansas State Court of Tax Appeals. Lee is a Democrat from Kensington in northwest Kansas. This action opens another position in the senate — another three pending vacancies need to be filled due to senators who won election to other offices — and others are likely to follow as incoming governor Sam Brownback fills his cabinet. Lee scored 13 percent on the Kansas Economic Freedom Index for this year, which is a voting record more in favor of economic freedom than some other Senate Democrats — and some Republicans such as Senate President Steve Morris, for that matter. Lee’s replacement will be selected by the Democratic Party precinct committeemen and committeewomen in that senate district. Saving is good. A letter in today’s Wichita Eagle holds this observation: “Rich people don’t spend money in hard times. Give them a tax break, and they will stash it away. That’s why they are rich.” This letter contains a misconception that news media mistakenly repeats over and over: that consumer spending is good and saving is bad. What happens to savings — the “stash it away” the letter writer refers to? Few people stuff cash in the mattress or in a safe. Instead, they do several things with they money they decide not to spend on immediate consumption, which is the definition of savings. If put it in a bank, the bank lends it to others who will spend it. If used to pay down debt, that frees up funds for others to spend. If used to buy stocks and bonds, that provides funds for business to invest. Importantly, these funds usually go into increasing the nation’s stock of capital. This capital spending is especially desirable, as it supports current economic activity — that is, the people and companies that work today to produce capital goods — but it sets up the country to produce even more wealth in the future. Voters express pessimism. Consistent with other recent Rasmussen polls, voters are not optimistic that Congress will be able to accomplish very much in the next two years. See Voters Hold Little Hope for What New Congress Is Likely To Achieve. Who stole Election Day? A candidate for Maine governor wonders whether the rise of advance voting — “convenience voting,” he calls it — is good for the country. Besides meeting a voter who expressed regret in having already voted for his opponent, Eliot Cutler writes this of convenience voting: “At a time when sea changes are roiling our democracy, political parties are in decline, and public confidence in the political system is plummeting, convenience voting is having all the wrong effects. In Maine, at least, it appears to be discouraging voter engagement, providing life support to withering political parties, and undermining one of our most enduring and important institutions.” More in the Wall Street Journal at Who Stole Election Day? Too many voters are making decisions when horse-race coverage dominates the news, attention to issues is limited, and key debates haven’t taken place. Karl Rove. “Former George W. Bush aide Matt Latimer was there to observe the dealings of Karl Rove during the previous administration, and he writes that there’s no secret why most conservatives have now come to view Rove as a fraud. Latimer says that Rove has become symbolic of a GOP establishment that’s known for its utter betrayal and ruin of the Party that Reagan had left so strong. Now that his secret is out, Rove’s influence will only continue to diminish as time goes on and the Tea Parties take over.” A fascinating look at the legacy of Rove, and illustrates the tension between the tea party and the Republican establishment. From Karl Rove’s Flameout. Waiting for Superman. The Kansas Policy Institute will host a free screening of Waiting for Superman on Thursday November 4th. Of the film, the Wall Street Journal wrote: “The new film ‘Waiting for ‘Superman'” is getting good reviews for its portrayal of children seeking alternatives to dreadful public schools, and to judge by the film’s opponents it is having an impact. Witness the scene on a recent Friday night in front of a Loews multiplex in New York City, where some 50 protestors blasted the film as propaganda for charter schools.” In Kansas, the Wichita Eagle printed an op-ed penned by the education bureaucracy status quo — Sharon Hartin Iorio, dean of the Wichita State University College of Education in this case — to inoculate Wichitans against the effects of what I am told is a powerful film. Let’s hope this film gets Kansans to thinking about public schools in our state, as Kansas is way behind the curve on innovation, compared to other states. The film will be shown at 7:00pm at the Warren Theatre East (11611 E. 13th St.). KPI asks that you RSVP by Tuesday, November 2 to James Franko at [email protected]. Space is limited. Brownback at Wichita Pachyderm. Friday’s meeting of the Wichita Pachyderm club will feature United States Senator and candidate for Kansas governor Sam Brownback. The public is welcome at Wichita Pachyderm meetings. For more information click on Wichita Pachyderm Club. Right to work = economic growth. In The Daily Caller, Emporia State University’s Greg Schneider looks at the history of unions in America and right-to-work laws. The number of union jobs has declined as unionized companies became less competitive, not because of right-to-work laws. Kansas private sector loses jobs, government grows. “Roughly 7,600 private sector jobs in Kansas disappeared from August to September, while government jobs grew by 21,000 over the same time period.” Most of the government jobs were in schools, writes Rachel Whitten in the Kansas Reporter. Tea Party plans to exert influence. As newly-elected members of Congress arrive in Washington to assume their seats, a tea party group plans to lay down expectations. “The meeting of newly elected officials, the date of which hasn’t been set, is designed to keep new representatives connected to ‘what we expect from them,’ according to the memo. Incumbent Republican members of Congress and the party’s national leadership won’t be invited, said Mark Meckler, co-founder of the Tea Party Patriots, in an interview. ‘The incumbents have allowed us to get into the problems we are in now,’ he said. ‘We hope to get to the freshmen before the incumbents get to them, and start twisting their arms.”” The full story in the Wall Street Journal is Group Plans to Keep Pressure on Newly Elected Conservatives. There is definitely conflict between the Tea Party and the Republican Establishment. Goyle numbers explained by rats and cats. Candidate for U.S. Congress from the Kansas fourth district Raj Goyle says he has voted with Republicans in the Kansas House of Representatives 80 percent of the time. While a detailed analysis of the votes would be difficult and time-consuming, the majority of measures voted on by legislatures pass nearly unanimously — the so-called “rats and cats” bills. The important cases this year where Goyle voted against his party — the big-spending budget and the statewide sales tax increase — represent either a genuine change in Goyle’s political philosophy, or election-year window dressing. Voters have to make the call. Holland claim doubted. In an interview with the Dodge City Daily Globe, Kansas governor hopeful Democrat Tom Holland said “Now I have a proven track record in the Kansas Legislature of reaching across the aisle and working with Republicans.” Evidence, however, points the other way. In the Kansas Economic Freedom Index for this year, Holland is the only Kansas Senator that earned a score of 0 percent. KEFI is not designed to group legislators into Republican or Democratic camps, but Holland ranks alone at the extreme end of the spectrum — voting against economic freedom in all cases. Arts in Wichita promoted. Today John D’Angelo, manager of Wichita’s Division of Arts and Cultural Services, contributes a piece to the Wichita Eagle titled How can Wichita sustain, grow arts sector? The answer to this question is: reduce government involvement in the arts, first by abolishing Mr. D’Angelo’s department and city taxation for spending on the arts. This will force arts organizations to meet the demands of consumers as expressed in free markets. Currently, a board of cronies dishes out tax money to arts organizations using political rather than market criteria. This process lets these organizations exists by appealing to Wichita’s cultural elites, rather than the broad market. See Government Art in Wichita. Economic fallacy supports arts in Wichita provides background to D’Angelo’s claim of the economic benefit of the arts, at least government spending on arts. In an attempt to increase highway safety, many states have passed bans on texting while driving. But the bans haven’t worked, and some states have experienced an increase in crashes. While Kansas was not included in the HLDI study, there’s no reason to think that Kansas will experience anything different from the states that were studied: Kansas drivers may be under greater risk of being in a crash after the passage of this law. Stricter enforcement of this law and higher fines will simply encourage the dangerous law-evading texting behavior. The texting ban was included in my Kansas Economic Freedom Index for 2010 for the Kansas Senate. Senators who voted against the ban increased their scores in favor of freedom. While I did not know the results of this study at that time, this is another example where instinctive distrust of government regulation was the correct diagnosis. For Republican Kansas Representative Don Hineman of Dighton, party loyalty is a street that runs in only one direction: towards himself. In 2008, Hineman challenged an incumbent Republican in Kansas House District 118. Hineman narrowly won the primary. The loser, Virginia Beamer, decided to mount a write-in campaign for the November general election. Hineman won, gathering 6,112 votes to Beamer’s 2,716. While I don’t agree with party loyalty oaths, this matter would be just a footnote — and not very interesting at that — if not for Hineman’s recent actions. Now, just two years after insisting that a political communications firm cease working for his opponent based on party loyalty, Hineman is campaigning for a Democrat. Not just any Democrat, but former Republican consultant Rob McKnight, who defected to the Democratic Party in order to run for a Kansas House seat from Overland Park. Hineman’s voting record in the Kansas House is that of a big-taxing and big-spending liberal. He voted for both the big-spending budget and for the statewide sales tax increase this year. He earned a rating of 19 percent on the Kansas Economic Freedom Index for 2010, and 30 percent on AFP’s legislative scorecard for 2010. He’s also opposed to giving citizens the power of initiative and referendum in Kansas. I am forwarding this email to introduce you to Rob McKnight. Rob is a very good friend, and has been my campaign advisor since I first ran for the Kansas House of Representatives in 2008. Evidently he thought I was having too much fun, because this year Rob is a candidate himself, after over twenty years as a campaign advisor to others. He is running to represent the 20th District in the Kansas House, and I would consider it a privilege to serve with Rob in Topeka. I would ask you to consider helping Rob during his campaign. Please think about making a contribution to his campaign (see information below) or help him during one of his scheduled “literature drops”, the first of which takes place the tomorrow, Saturday, September 18. The attached flyer has more information. Please note this is not knocking on doors; it is merely a door-to-door literature drop. Participants will cover a large amount of territory in a short amount of time. Rob thinks of everything. The drop is scheduled on a Saturday when the Kansas Jayhawks are idle, so no one need to be distracted by other events. Please consider helping Rob with this event tomorrow. Rob is very deserving, and I know he will be very grateful for your help. Here’s a look at the August 3, 2010 Kansas primary election contests that had the possibility of changing the character of the Kansas House of Representatives, and in one case, the Kansas Senate. A Kansas Chamber of Commerce endorsement is a reliable measure of a candidate’s conservative credentials from a fiscal perspective. The Kansas Economic Freedom Index and AFP legislative scorecards provide additional insight into legislators and their voting records. Here are races where there may be a shift in the makeup of the House, sometimes depending on the results of the November general election. In Kansas House District 17 (parts of Shawnee and Lenexa) the Kansas Chamber of Commerce endorsed Kelly Meigs, and she defeated one-term incumbent Jill Quigley 53 percent to 47 percent in the Republican primary. Bryan Cox has filed as a Democrat. Quigley had a liberal voting record, scoring just nine percent on the Kansas Economic Freedom Index. In Kansas House District 29 (parts of Overland Park) conservative challenger Richard Downing wasn’t able to defeat first-term incumbent Sheryl L. Spalding (19 percent on KEFI), although the margin of Spalding’s victory is just 29 votes of 2,695 cast and could possibly change. The winner will face Democrat Doug Dowell in the general election. In Kansas House District 65 (Junction City and parts of Geary and Wabaunsee counties), Barbara Craft did not seek re-election. Her Kansas Economic Freedom Index rating of 19 percent places her in the left-wing Republican camp. The Kansas Chamber did not make an endorsement in this district, but Republican primary winner James P. Fawcett has been described as a conservative. He’ll face Democrat Larry Hicks in November. In House District 110 (Osborne, Rooks and Russell Counties, Cities of Ellis and Victoria, Buckeye, Catherine, Ellis, Herzog and Victoria townships) three Republicans vied to fill this seat previously held by Dan Johnson with his 16 percent Kansas Economic Freedom Index score. Chamber-endorsed Dan L. Collins won. No Democrat filed in this district, so this is a certain pick-up for conservatives. In House District 69 (parts of Salina) Chamber-endorsed Tom Arpke defeated incumbent Republican Deena L. Horst, who has represented the district since 1995. Horst had earned a score of 69 percent on the Kansas Economic Freedom Index. On AFP’s rating for this year she scored 60 percent and 100 percent the year before. She voted for the big-spending budget this year, but not the sales tax increase. Arpke will face Democrat Gerrett Morris — not to be confused with Garrett Morris of Saturday Night Live fame — in November. In Kansas House District 124 (Grant, Morton, Stanton and Stevens counties, Haskell County: City of Satanta and Dudley Township, Seward County: Seward Township), incumbent Bill Light did not seek re-election. Republicans Dan Widder and J. Stephen Alford sought the Republican party nomination, with no Democrats having filed. The Chamber endorsed Widder. Alford narrowly won with 51 percent of the vote. Light was a left-wing Republican with a Kansas Economic Freedom Index rating of 11 percent. Alford, endorsed by liberal Senate President Stephen Morris (his own KEFI rating is only seven percent), can’t be much more to the left than Light. There were a handful of instances where moderate or liberal Republicans withstood challenges by conservatives. In Kansas House District 9 (Allen County plus parts of Woodson, Coffey, Anderson, and Franklin Counties, including the city of Iola), the Chamber selected Raymond “Bud” Sifers over incumbent Bill Otto in the Republican primary. Otto won with 56 percent of the vote. No Democrat filed. Otto is sometimes difficult to classify. He scored 60 percent on the Kansas Economic Freedom Index, but only 40 percent on AFP’s scorecard for this year after rating 82 percent the year before. This year, Otto voted against the spending bill but for the sales tax increase, the only member of the House to vote this way on these two bills. In Kansas House District 60 (parts of Emporia) incumbent Republican Don Hill defeated challenger Daniel Buller. Hill scored a very liberal nine percent on the Kansas Economic Freedom Index and is mentioned as one of the leaders of the left-wing Republican faction of the House that votes for spending and tax increases. Hill will face Democrat Michael “Mike” Dorcey in the general election. In Kansas House District 64 (Clay County plus parts of Dickinson, Geary, and Riley counties) incumbent Republican Vern Swanson was challenged by Michael Musselman. Swanson won. No Democrat filed. Swanson scored 19 percent on the Kansas Economic Freedom Index. In Kansas House District 68 (parts of Morris and Dickinson counties including Council Grove and Abilene) two-term incumbent Republican Tom J. Moxley was challenged by Calvin Seadeek Jr. Moxley has a liberal voting record, scoring 19 percent on the Kansas Economic Freedom Index. There is no Democratic party opponent in the general election. In Kansas House District 70 (Chase and Marion counties, plus part of Butler County) Cheryl Green challenged first-term incumbent J. Robert (Bob) Brookens (KEFI 19 percent). Brookens won with 60 percent of the vote. There was no Democratic Party filer. In Kansas House District 71 (parts of Salina) incumbent Charlie Roth withstood a challenge by two opponents in the Republican primary. There is no Democratic Party filer. Roth scored a liberal nine percent on the Kansas Economic Freedom Index and played a leadership role in passing the statewide smoking ban in the House of Representatives this year. In Kansas House District 83 (Eatborough and parts of east Wichita) veteran incumbent Jo Ann Pottorff defeated conservative challenger Kyle Amos. The Chamber chose Amos for its endorsement, and Pottorff scored a low 13 percent on the Kansas Economic Freedom Index. Sean Amore is the Democratic Party opponent in the general election. In the Kansas Senate, there was one election this year. The appointed incumbent for Senate District 7 (In Johnson County the cities of Countryside, Fairway, Merriam, Mission, Mission Hills, Mission Woods, Prairie Village, Roeland Park, Westwood, Westwood Hills, and parts of Leawood and Overland Park) is Terrie Huntington, and she faced a conservative challenge from David Harvey. Huntington’s votes for the big-spending budget and the sales tax increase earned her a Kansas Econimic Freedom Index score of 20 percent, and led to the Kansas Chamber endorsement of Harvey. Huntingon won with 54 percent of the vote. Conservatives withstood some challengers in these districts. In Kansas House District 13 (Eureka, Yates Center, Fredonia, Neodesha and surrounding area) the Chamber endorsed incumbent Forrest Knox over challenger Trent Forsyth in the Republican primary. No Democrat filed. Knox scored 95 percent on the Kansas Economic Freedom Index, and Forsyth was endorsed by the liberal teachers union. Knox won with 54 percent of the vote. In Kansas House District 121 (Graham, Sheridan, Sherman and Thomas counties), Brenda McCants challenged incumbent Jim Morrison, with no Democrat filing for the general election contest. Martin Hawver, dean of Kansas Statehouse reporters, described this as a a race “more about experience — coming up to reapportionment — than philosophy, not a moderate/conservative split.” But Morrison had the Kansas Chamber’s endorsement and a reliably conservative voting record. At an event this afternoon in Wichita, bipartisanship and reaching across the aisle — plus some Sam Brownback bashing — was the theme as outgoing Kansas Governor Mark Parkinson endorsed the team of Kansas Senator Tom Holland of Baldwin City and fellow Senator Kelly Kultala of Kansas City for the Democratic Party nomination for Kansas governor. Parkinson, who became governor last year when Kathleen Sebelius took a position in the Obama cabinet, declined to seek election to his current office. The Holland/Kultala ticket will not face opposition on the August 3rd primary election ballot. The likely Republican nominees are Sam Brownback and Kansas Senator Jeff Colyer as lieutenant governor. In his remarks, Parkinson said that Kansas has made “remarkable progress” in the last eight years in working through a recession, creating jobs, and “bringing people of all parties together.” He said that Holland would continue that work. He told the audience that Holland is a successful businessman, experience that he said Holland’s likely opponent did not have. He said that Holland has a record of working with people of all parties, and that Holland has worked for Kansans in the legislature. He praised Holland’s and Kultala’s role as leaders in passing the budget this year. Parkinson said the election will be an “uphill climb,” but that a Holland/Kultala victory is possible. Holland said that the next governor will need to work with the coalition of moderate Republicans and Democrats, who he said have been leading the legislature for the last few years. He said that only he and Kultala — the “moderate and pragmatic leadership” — can continue with this tradition. He blasted Brownback as a “career Washington politician” who deregulated the banks and “put the Kansas economy in a tailspin.” He said Brownback opposed the budget this year, and he opposed paying for the transportation plan. He said that Brownback “sits on the extreme fringe of his party” and has no interest in working with moderate Republicans or Democrats. In a question after the event, Parkinson expressed confidence that the increase in the sales tax that took effect today will roll back in three years as scheduled, despite the failure of a sales tax increased passed in 2002 to live up to its rollback schedule. Holland makes the argument that he and Kultala are “pragmatic and moderate.” Evidence from the candidate’s voting records is different, however. In the Kansas Economic Freedom Index for this year, Holland earned a score of zero, the only senator to do so. Kultala earned a score of seven percent, earning her a tie for 36th place among the 40 senators. She voted in favor of economic freedom only once. In a score card just released by the Kansas Chapter of Americans for Prosperity, Holland again earned a score of zero percent. Kultala matched that “perfect” score. It might seem that someone interested in bipartisanship and reaching across the aisle might vote that way just once in a while. As to the governor’s portrayal of Holland and Kultala as leaders reaching across the aisle, background discussions with several Republican members of the Kansas Senate could produce no recollection of any significant issue where Holland or Kultala played a leadership role. Both have served in the Senate for just two years and are in the minority party. The portrayal of Brownback as “fringe” must be examined. Brownback’s record in the U.S. Senate, according to National Journal vote ratings for 2009, places him near the middle of Senate Republicans in terms of voting for conservative positions.